A critical part of any Quality Control (QC) or Quality Assurance (QA) program is the sampling procedure. Unfortunately, if a sample is obtained that is not representative of the material used on the project the subsequent testing and analysis becomes irrelevant at best and costly at worst. It is a good idea to periodically review the fundamentals of correct sampling procedures to ensure that the materials used can be properly characterized. – What documented method is required to obtain the sample? – Where are the approved locations for sampling? – What equipment will I need to obtain and transport a proper material sample? – How should I document the sample? This article will first discuss fundamentals regarding sampling methods, then cover more specifics regarding three material types: asphalt binder, aggregate and plant mix. A key component of obtaining a representative sample of any construction material is the concept of random sampling. Random means that all parts of the lot of material have an equal chance of being included in the sample. Over time, this method will statistically provide the clearest picture of the material. It will avoid bias due to, for example, repetitive patterns such as shift changes in production. Other sources of bias can include things like equipment operator bias and changes incurred due to equipment cycling on and off at regular intervals. ASTM D 3665 provides the standard practice for random sampling of construction materials. It suggests that the best and most practical method for ensuring that samples include the full range of a construction process is to utilize a procedure called stratified-random sampling. This procedure divides the lot to be sampled into the desired number of equal sublots and then calls for random samples of each sublot. This method preserves the random sampling concept, but ensures that samples are obtained throughout the lot and precludes the possibility of acquiring random numbers that result in samples clustered in only one area of the lot. In the example showing one lot with nine random samples, the beginning and ending sections of the lot contain 8 of the 9 sampling locations, leaving the middle under-represented. By stratifying the lot into three sublots with three samples each, each section is adequately represented. After the details of where to sample and how often to sample are determined, the focus shifts to obtaining the sample. The three materials that are typically sampled in asphalt-related projects are asphalt binder, aggregate, and plant mix. One lot with nine random samples. Safety should be kept in mind at all times when sampling asphalt binder. Appropriate personal protective equipment such as face shields, sleeves and gloves must be worn when obtaining samples. Although binder can be sampled quite safely, a lapse of attention or judgment can result in serious burns. Two nationally-recognized standards for sampling asphalt binder are AASHTO R 66 and ASTM D 140. The basic procedure is the same for both standards with minor differences in wording and allowable sample sizes. 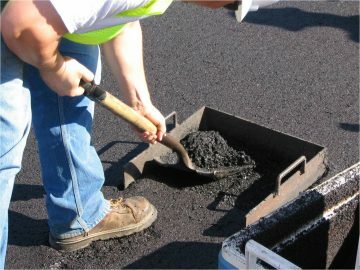 Asphalt binder can be sampled at a number of different places. 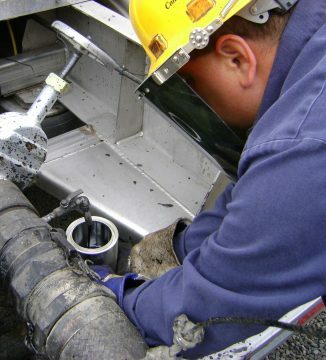 At refineries, a combined sample is typically taken from sampling valves located at the top, middle and lower locations of the storage tank. As with any sample obtained from a valve or tap, approximately 1 gallon of binder should be drawn and discarded before the sample is taken. This practice will flush out any potential contaminants from the valve itself and provide a sample which is more representative of the contents of the tank. At the plant, binder samples are obtained from one of three points: the delivery truck, the delivery lines from the truck to the storage tank or from the storage tank. Samples from the delivery trucks are more representative of the binder delivered by the supplier, but samples from the storage tank are more representative of the binder that is incorporated into the mix. Samples from the delivery truck or storage tank are usually obtained from a valve located somewhere near the bottom of the tank. 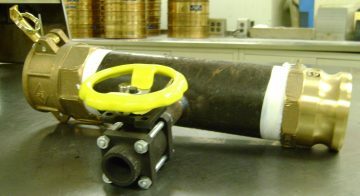 For sampling from the delivery line a detachable fitting is used. Asphalt binder samples are typically stored in 1-quart, wide-mouth, triple seal, friction-top cans, like paint cans. Sample containers must always be new and clean. They cannot be washed or rinsed, or wiped with an oily cloth. The container should be sealed immediately after filling. Never re-use a sample container. Also, keep a supply of clean, dry cloths available to clean containers after sampling. If sampling emulsions, make sure to use plastic or plastic-lined cans. A document is often included with the sample that includes more detailed information. Just like obtaining a sample that is not representative of the material used, a blank can of mystery material brought to the testing lab is a waste of the time and effort expended to obtain the sample. Two nationally-recognized standards for sampling aggregates are AASHTO T 2 and ASTM D 75. These standards are virtually the same. The basic criteria for any sampling location are a minimum of three approximately equal increments, randomly obtained, which are combined to form a field sample of the required size. There are exceptions, such as sampling fine aggregate using a tube, which requires a minimum of five increments. Many plants have either manual or automatic devices to sample from a flowing aggregate stream safely, and without stopping production. These devices are usually located in an area which will catch a combined aggregate sample. The device must sample the entire cross-section of the stream and have a pan large enough to hold the entire sample without overflowing any portion of the stream. The pan should never be manually passed through the moving stream by the sampler. Another viable option is to sample from a conveyor belt. In this case, templates conforming to the shape of the conveyor are required. Space the templates so that the material between them equals the desired size (1/3 of the total sample size if obtaining 3 increments). It is important to use a whisk or similar tool to obtain 100 percent of the material between the templates. A common drawback to sampling from the conveyor belt is that production has to be halted to obtain the sample. However, several manufacturers now produce devices that will obtain a belt cut from moving, loaded conveyor belts. 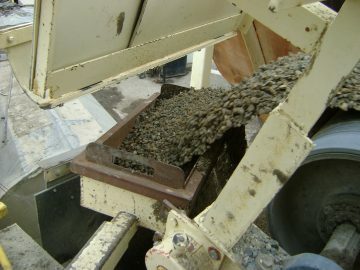 Many people who regularly obtain aggregate samples might be surprised on the qualifier applied to sampling from stockpiles. 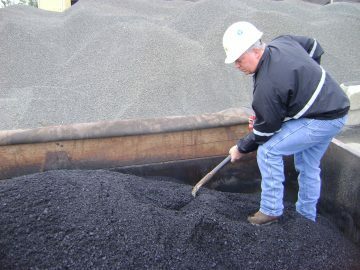 A direct quote from the standard is “Avoid sampling coarse aggregate or mixed coarse and fine aggregate from stockpiles or transportation units whenever possible.” Coarse aggregates and aggregates with both coarse and fine portions are prone to segregation when stockpiled on the ground or in trucks, railcars and barges because the coarsest particles tend to roll to the outside base of the pile. If samples must be obtained from a stockpile, there are ways to increase the probability of obtaining a representative sample. 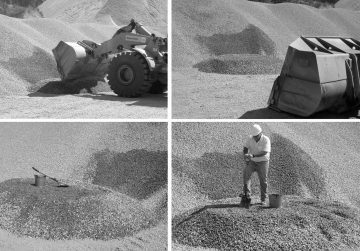 The best option is to make a smaller sampling pile often called a “power pile.” This is done by scooping aggregate from the main pile in various locations and elevations around the pile using a front end loader and creating the sampling pile. The sample can then be blended from several samples taken at various increments from the sampling pile. Aggregate bases can also be sampled directly from the roadway. Samples are usually obtained with the help of a metal template, which defines the boundaries of the sample and ensures that the samples are taken in even increments. It is important to take the full depth of the material, without including any of the underlying material. Again, take at least three approximately equal increments, randomly selected, and combine to form a field sample that meets or exceeds the specified minimum requirement. Samples may be placed in clean buckets, cloth sacks, or plastic bags. As with binders, it is important to write the sample information on the container to properly identify the sample. Samples from a truck transport are more representative of the material as produced by the plant. QC personnel may prefer this location because the data allows for more reliable adjustments to the plant. They may not want to rely on results from the roadway because the loading, transport and paving operations may induce some segregation that plant adjustments would only make worse. However, samples from the roadway are more representative of the final product, and may be preferred by QA personnel. ASTM D 3665 illustrates the proper method for determining random sampling from a truck transport. First, determine the number of truck loads that will represent a lot or sublot of material. For example, if the sublot size is 1000 tons and the average truck load is 15 tons, it will take 1000/15 ? 67 trucks. Multiply the random numbers (between 0 and 1) by the number of trucks to obtain the truck numbers to sample. The bed of each truck to be sampled is then split into four quadrants. To select which quadrant to sample, another random number is selected and multiplied by four, then rounded to the nearest whole number. The number represents the quadrant to be sampled. Again, the field sample is composed of a combination of at least three equal increments to equal or exceed the sample size requirements. The procedure allows the sample to be taken with a scoop or a shovel. However, avoid sampling the extreme top surface. For roadways samples, both prior to and after compaction, the first step in determining where to sample is to calculate the length that represents a lot or sublot for the width of the pull. For each location, separate random numbers are multiplied by the length and width. This process gives the distance of the sampling location from the start point and also the offset from a predetermined (either the left or right) longitudinal edge. Just like sampling an aggregate base, the sampling of plant mix on the roadway prior to compaction is facilitated by the use of a metal template. The use of a template is not a requirement, but it helps to ensure that equally sized increments are obtained. It is important to ensure that the entire depth of the lifts is obtained excluding any underlying material. The most common method of obtaining a sample from the roadway after compaction is through a coring operation. Other lifts that may be stuck to the core must be removed by sawing or splitting before the material is tested. Whether coring, sawing or some other method it is critical to minimize disturbance to the material. This is usually accomplished by wet-cutting with diamond-studded core barrels. The removed cores must be handled carefully because they are susceptible to damage from heat and point loads. In summary, a good sampling program obtains material that is representative of what is being used. Using an accepted sampling method builds confidence in the quality of the sample and proper documentation ensures the integrity of program. Danny Gierhart is an Asphalt Institute Regional Engineer based in Oklahoma City, Oklahoma. An interactive guide to everything about asphalt pavements and pavement treatments including local Hawai’i guidance, procedures and designs.